After having no new posts for last week's IMWAYR, this week I've overcompensated by joining the Slice of Life Challenge! New Book Alert: Celebrate Holi with Me! I share a review of the newest entrant in the From the Toddler Diaries series - just in time for Holi. #diversekidlit: Changing Seasons. Come celebrate books about spring (or fall, hemisphere-dependent) for this month's Diverse Children's Book Linkup! Natasha and Daniel alternate narratives within the book (with the occasional side note from an omniscient narrator), and I loved how the audio version added so much to their individual characters (yes, even the narrator's). Theirs is a story about the universe, about love, about fate, but mostly about the crazy interconnectedness between everything that happens - whether we can see those connections or not. Young adult me would have also thoroughly enjoyed this story, especially as a I struggled with feeling both trapped and uncertain about what the future might hold. 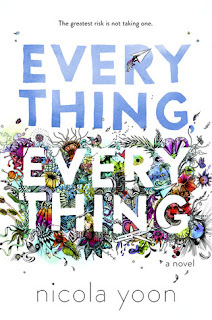 Everything Everything (2015) by Nicola Yoon. Inspired, I then immediately turned around and checked out her first novel, Everything Everything, which revolves around a girl named Maddy who has "bubble boy" syndrome. 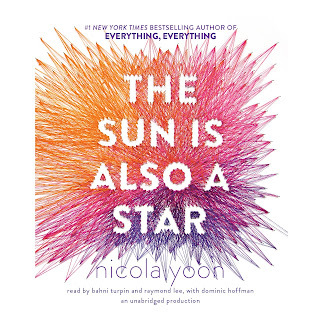 This one I did not like as much, perhaps because I enjoyed The Sun is Also a Star so much, perhaps because it seemed at times too much like A Fault in Our Stars, perhaps because I just hard a harder time connecting with the characters. I'd be curious to hear from those who gush about this one. I still haven't read either one of these Katie, but am glad to hear you enjoyed them as so many have.Writing for SOLC takes a lot to time! I loved both of these books! I'm in the same boat this month--my reading time is being shared with my writing time for SOLC and I can't figure out how to create more moments in a day to do it all! I'm glad I read Everything Everything before The Sun is Also a Star, which I picked up from the library last Saturday. I enjoyed Everything more than I expected and was really taken off guard by that ending. We are so impressed you could post on Mondays and do SOL#17 - That is a ton of work! Thanks for telling us your thoughts about these books. We will save these for summer reading. I read The Sun is Also a Star first too. Haven't gotten to E,E. I've heard great things about it. Maybe since there will be months between the two I'll enjoy it?? I have also started to listen to audiobooks during my commute. I have Nicola Yoon's books on my hold list. I recommend listening to Ghost by Jason Reynolds well done audiobook. I found The Sun is Also a Star to be both a much different and much better story.